See also: pan- and Appendix:Variations of "pan"
From Middle English panne, from Old English panne, from Proto-Germanic *pannǭ. Cognate with Dutch pan, German Pfanne. A wide, flat receptacle used around the house, especially for cooking. The contents of such a receptacle. A cylindrical receptacle about as tall as it is wide, with one long handle, usually made of metal, used for cooking in the home. (Ireland) A deep plastic receptacle, used for washing or food preparation; a basin. 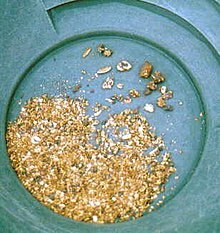 A wide receptacle in which gold grains are separated from gravel by washing the contents with water. (geography) a specific type of lake, natural depression or basin. They are sometimes associated with desert areas. (obsolete) The chamber pot in a close stool; (now) the base of a toilet, consisting of the bowl and its support. (slang) A human face, a mug. This was the kind of operator who would tell you to be there at nine sharp and if you weren't sitting quietly with a pleased smile on your pan when he floated in two hours later on a double Gibson, he would have a paroxysm of outraged executive ability […]. (roofing) The bottom flat part of a roofing panel that is between the ribs of the panel. A closed vessel for boiling or evaporating as part of manufacture; a vacuum pan. The part of a flintlock that holds the priming. The skull, considered as a vessel containing the brain; the brainpan. Give I thy body and my pan also." (carpentry) A recess, or bed, for the leaf of a hinge. The hard stratum of earth that lies below the soil; hardpan. (transitive) To wash in a pan (of earth, sand etc. when searching for gold). We […] witnessed the process of cleaning up and panning out, which is the last process of separating the pure gold from the fine dirt and black sand. (transitive) To disparage; to belittle; to put down; to criticise severely. (intransitive) With "out" (to pan out), to turn out well; to be successful. (transitive, informal, of a contest) To beat one's opposition convincingly. From a clipped form of panorama. (intransitive) Of a camera, etc. : to turn horizontally. Later today in Finsbury Park, the cameras would spend hours panning across 35,000 festivalgoers in search of pickpockets, drunken brawlers, and other assorted agents of petty mischief. (intransitive, photography) To move the camera lens angle while continuing to expose the film, enabling a contiguous view and enrichment of context. In still-photography large-group portraits the film usually remains on a horizontal fixed plane as the lens and/or the film holder moves to expose the film laterally. The resulting image may extend a short distance laterally or as great as 360 degrees from the point where the film first began to be exposed. (audio) To spread a sound signal into a new stereo or multichannel sound field, typically giving the impression that it is moving across the sound stage. Compare French pan (“skirt, lappet”), Latin pannus (“a cloth, rag”). To join or fit together; to unite. (fortifications) The distance comprised between the angle of the epaule and the flanked angle. A leaf of gold or silver. When she publicly acknowledged that she is pan, it educated citizens near and far on what that sexuality meant and the importance of being proud of who you are. Another anonymous pansexual disclosed, "Sometimes I feel really left out because I'm pan. […] "
A similar experience is shared by individuals who identify their sexuality as pan, bi or queer. For more examples of usage of this term, see Citations:pan. From Spanish pan (“bread”), from Latin pānis, from Proto-Indo-European *peh₂- (“to feed, to graze”). This is the form used when followed by a name, title, occupation etc. Kdy přijde pan doktor, sestřičko? When will the doctor come, nurse? From Middle Dutch panne, from Old Dutch *panna, from Latin panna, contraction of patina. From Latin pannus. Doublet of pagne. “pan” in le Trésor de la langue française informatisé (The Digitized Treasury of the French Language). From Old Galician and Old Portuguese pan, from Latin pānis, pānem. Cognate with Portuguese pão. “pan” in Dicionario de Dicionarios do galego medieval, SLI - ILGA 2006-2012. “pan” in Xavier Varela Barreiro & Xavier Gómez Guinovart: Corpus Xelmírez - Corpus lingüístico da Galicia medieval. SLI / Grupo TALG / ILG, 2006-2016. “pan” in Dicionario de Dicionarios da lingua galega, SLI - ILGA 2006-2013. “pan” in Tesouro informatizado da lingua galega. Santiago: ILG. “pan” in Álvarez, Rosario (coord. ): Tesouro do léxico patrimonial galego e portugués, Santiago de Compostela: Instituto da Lingua Galega. From Old French pan, from Latin pannus. From Old Occitan pan, from Latin pānis, pānem. From Latin pānem, accusative singular form of pānis. 14th c. Unknown etymology. West Slavic word. From Proto-Slavic *gъpanъ, from Iranic source. Cognate to Old Czech hpan, modern Czech pán and pan, Slovak pán and Lower Sorbian pan. Czy mógłby pan zamknąć drzwi? – Could you close the door? From Latin pānis, pānem (compare Catalan pa, French pain, Galician pan, Italian pane, Portuguese pão, Romanian pâine), possibly from Proto-Indo-European *peh₂- (“to feed, to graze”). Para mi desayuno, tomo pan y leche. For my breakfast, I have bread and milk. From Latin pānis, pānem. Compare Italian pane and Neapolitan pane.